Many people say they want to create change but, do little to see that change occurs. Signing & sharing this petition that goes directly to Judge Allison Burroughs, who is responsible for their sentencing, is the easiest step you can take to make the greatest impact to punish federally convicted startup medical device executives. 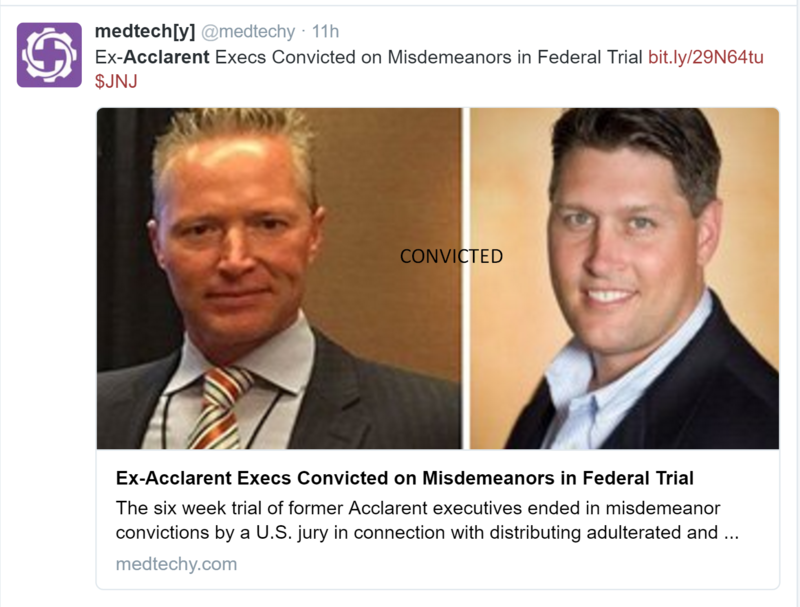 A Boston federal jury, under the direction of Judge Allison D. Burroughs, convicted Johnson & Johnson’s Acclarent’s CEO William (Bill) Facteau & Patrick (Pat) Fabian on 10 misdemeanors. Facteau is currently CEO of venture capital-funded startup EarLens and Fabian is currently CCO of venture capital-funded startup NxThera. Please sign and share this petition that goes DIRECTLY TO JUDGE ALLISON BURROUGHS and tell her that you won’t see illegal behavior encouraged, replicated and rewarded. As the sole federal whistleblower in this case, I’ve been removed from the industry, isn’t it time we do the same with the executives who’ve been convicted of federal crimes? This case represents the first time a medical device was taken off the market before it could do potential damage to the community. Discovered during the criminal trial, the adverse events were under-reported to FDA as we’ve seen with many other medical devices, long after patients were injured. If you’ve been injured by Gynecare mesh, acquired by Johnson & Johnson or Conceptus birth control later acquired by Bayer renamed Essure, please understand that the world’s largest venture capital firm, New Enterprise Associates (NEA) funded these companies along with Acclarent later purchased by Johnson & Johnson. This is just the first step in exposing a long line of corruption where NEA has been paid to kill women. Please do your part, sign and share the petition that goes directly to the judge responsible for sentencing. Thank you to MAM-Mesh Awareness Movement, Mesh Problems, Mesh Medical News Desk and all the women and men who have signed and shared the petition. If you would like your organization’s name added to the list supporting this petition please comment below and I’ll and your organization. Please don’t let these criminals go free. This is exactly what we need! Spreading awareness and making these manufacturers LIABLE for deaths, harm and suffering! I am headed to Washington DC in September with a strong group of women to speak on this very topic! HR 5403 Ariel Grace’s Law and The Medical Device Guardian Act.. The same devastating and debilitating harm is happening with silicone and saline Breast Implants. The Breast Implant Associated Anaplastic Large Cell Lymphoma, BIA-ALCL on the rise! We need full inform consent, defective implanted medical devices off the market and our day in court!!!! I will sign and share! Bad enough charges reduced to misdemeanours but the thought of them getting away scot free makes me feel ill. Put them in jail and pay for our medical expenses! Yes, Carl but one must be willing to take the blinders off to see this money was obtained by fraud, which makes both the dollar amount and the men far less impressive. No one is suggesting, even the courts, that this money was obtained fairly, which is why Johnson & Johnson who purchased the subsidiary paid $18 million in damages. injury and Death of innocent patients and the fleecing of the public will continue until CRIMINALS like these are put away and get substantial penalties. Putting a device, that they know will harm people, on the market just to make a profit is inexcusable and should merit the strongest penalty! I feel for all the women injured and now deceased at the hands of these two criminals but it is much larger than these two. I myself have been left disabled by “FDA approved” bile duct/pancreas stents and also kidney bladder stent. I never gave consent on none of the medical devices implanted and it is impossible to get my Medical Implant Device Sheet,required by law. A Gag Order was offered to me to keep silent but I refused for moral reasons (something that you will not find in the AMA and FDA). Now I am left to suffer and watch all my fellow Americans go through the genocidal abuse that is sweeping across America. THIS MUST STOP! This is Fascism and we have already seen what Fascism did on Germany. History is repeating itself but this time it is wrapped in the American flag. Almost all medical devices follow this same pattern, as a startup with the goal of making money quickly to get their investors their ROI by IPO or acquisition, where there’s little concern of the longterm outcome for the patients. You are correct THIS MUST STOP! Thank you for taking the time to comment and share your painful story. Cannot get info from federal government what brand was implanted in me at a USAF Hospital. Have suffered almost 27 years and now new complications, with no surgeon willing to remove the mesh. Probably impossible, I’m told. Marina, I’m sorry to hear what you’re going through. Thank you for sharing your story.